When I tasted this dessert that my friend Emily originally made, I knew I wouldn’t be able to resist getting the recipe from her and making it my own. The dessert is a lovely combination of not too sweet buttermilk chocolate cake, lightly sweetened whipped cream, and rich caramel sauce topped with homemade toffee. Of course you could always substitute the homemade toffee for crushed Heath bars if you desired as well. You will use about half of each recipe above. Whip together using the highest possible setting on your mixer until soft peaks form, about three minutes. Note: If you do not have buttermilk for this recipe, you can make traditional buttermilk by taking one cup of heavy whipping cream and beating for about ten minutes. The whipped cream mixture will separate into about 1/2 cup buttermilk and 1/2 cup butter. Use this butter for the 1/2 cup of butter and 1/2 cup buttermilk called for in the above recipe. Boil one cup of water in a teapot or pan on the stove. In a medium size pan, add the boiling water, cocoa, and butter together. Heat until butter melts, but do not boil. Remove from heat. In a medium size bowl, mix together the flour, sugar, and baking soda. Whisk together the eggs, oil and buttermilk, then transfer to the dry ingredients. Beat on medium speed just until moistened. Add the cocoa mixture to the egg and flour mixture and beat to completely combine. Batter will be runny. Bake in a greased and floured (I use cocoa powder) medium bunt pan at 350 F for 40 minutes or until toothpick inserted comes out clean. Cool in pan for five minutes, then remove from pan and cool on wire rack completely. Take one slice of buttermilk chocolate cake and top first with 2 T whipped cream, 2 T rich caramel sauce that has been warmed, and then a sprinkle of crushed homemade toffee or Heath bars. Serve immediately. These Cordial Cherry Brownies were a big hit at a party I went to the other night. My kids were so disappointed they didn’t get any. This brownie recipe is so easy to make because I use a brownie mix. Super easy! For the brownies, I followed the directions on the box for the cake-like brownies. I then let the brownies cool for a few minutes, removed them from the muffin tins, then made an indent into the center of each muffin which I then filled with one cherry from the canned pie filling. I ended up not having enough cherries for the two boxes of cherry pie filling, so I made a toffee sauce to fill the remaining brownies. Here’s how to make cordial cherry brownies. Prepare and bake the brownies according to the cake-like version in a greased mini-muffin tin (should make around 40 brownies total). Be careful not to overbake. Allow brownies to cool for two minutes in tin and then carefully remove. Using your knuckle or thumb, make an indentation into the center of each brownie. Fill with one cherry from the canned pie filling for each brownie. Drizzle melted white chocolate over the tops of the brownies. Enjoy and serve either immediately or cover and serve for later. Or cheat and keep them all for yourself! I won’t tell. One of my favorite desserts as a child were moist, chewy moonpies that I would get on special occasion from my great-grandma Dolly. She didn’t make hers by hand, but rather bought them from Mrs Bairds (still my favorite breadstore). The moonpies Grandma Dolly bought were filled with marshmallow and came in five flavors: vanilla, chocolate, strawberry, banana, and lemon–chocolate being my favorite of course. The kind I purchase at Mrs Bairds come covered in a thick icinglike coating and are easily addictive. So one day I set out to recreate these chocolate heavensents and I think I came pretty close. I left my moonpies uncoated, but you could easily melt some chocolate bark and either dip them in it or pour it over the top for a more traditional look. 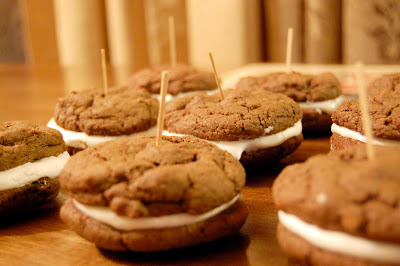 Note: Some people, mostly Northerners (aka Yankees) call these delicious desserts Whoopie Pies. I told my oldest kid that and he thought I was going to spank him. Personally when I say Whoopie Pie, I think of Sister Act or Corina Corina. Cream together sugar and shortening until light and fluffy. Add egg yolks, one at a time, beating very well in between. Sift together dry ingredients and add to the creamed mixture, scraping sides of bowl as needed. Drop by tablespoon (I prefer to use my hands) onto lightly greased cookie sheets. Bake at 350 F for 8-10 minutes or until done. Do not overbake! Makes 16-18 cookies, which will equal 8-9 moonpies. 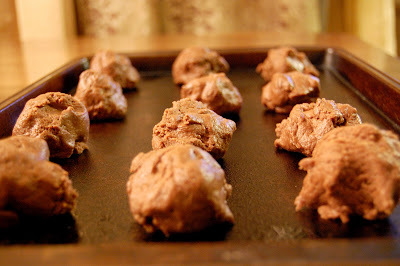 As each batch finishes baking, remove from oven and let cool for two minutes on cookie sheet. 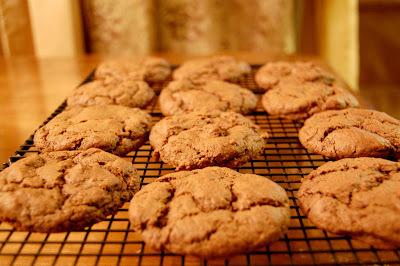 Then, using a spatula, remove cookies and place on cooling rack to cool completely. Once all cookies have finished baking and cooling, it is time to make the marshmallow filling. Use this recipe for Homemade Marshmallows to make the filling to be used for the moonpies, except do not spread on cookie sheet just yet. 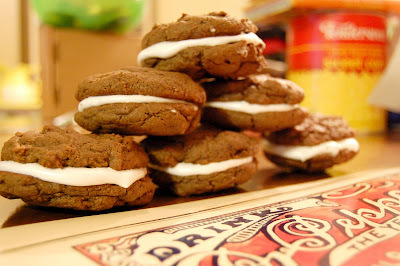 Instead, immediately spread on one cookie, let set slightly; then cover with another cookie to create a cookie sandwich. Use a wooden toothpick to help moonpie retain it’s shape. Let set for one to two hours. Coat with chocolate if desired. Pour the remaining marshmallow mixture into a powder sugar coated cookie sheet and spread evenly. Allow to set overnight or for four to six hours, and then cut into squares for homemade marshmallows. Eat and enjoy the moonpies with a tall glass of milk.